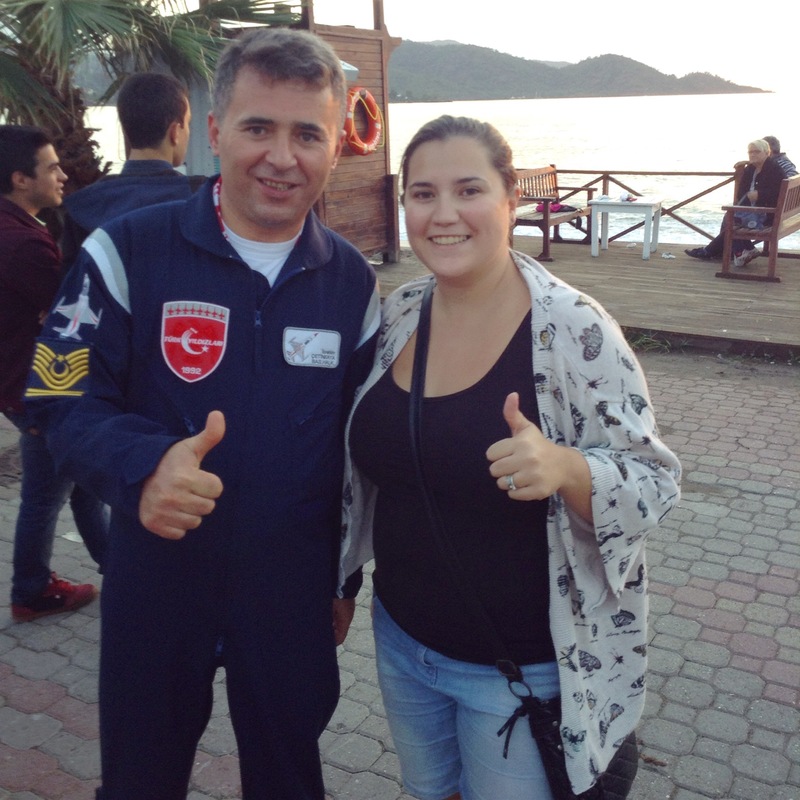 Türk Yıldızları – Turkish Stars visit Fethiye! 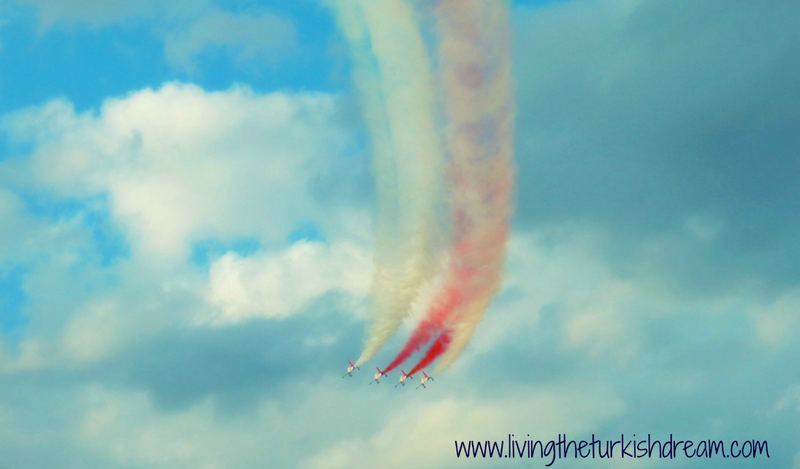 On Saturday I was lucky enough to witness the Türk Yıldızları (Turkish Stars) in action- the fighter jet aerobatic display team of the Turkish air force. It was an amazing experience. 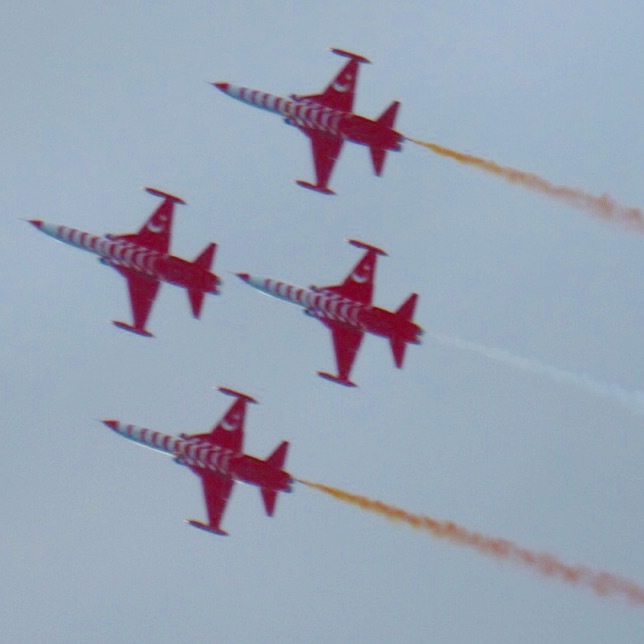 Anyone who has friends in Calis or Fethiye is likely to have seen their Facebook feeds full of photos and videos from the event, which shows how impressive their performance was, and how proud the Turkish people are of their military. 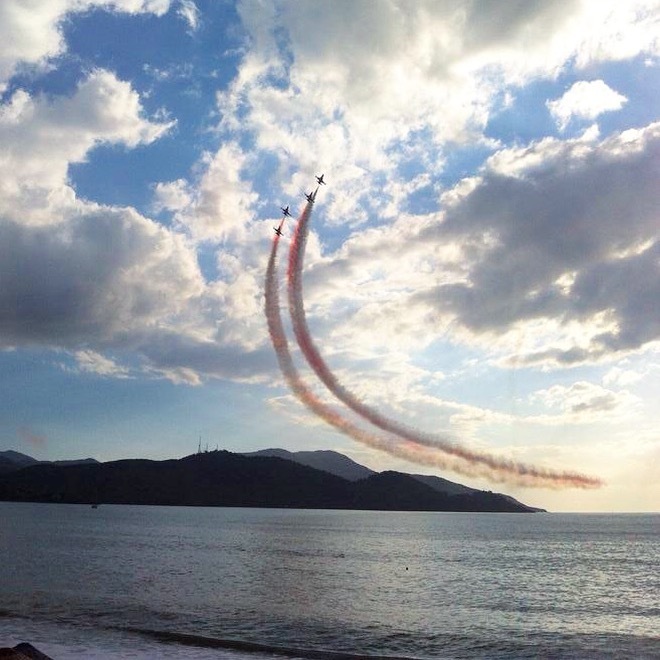 The Turkish Stars were scheduled to do their display here in Calis as part of the Ölüdeniz air games that took place all last week. 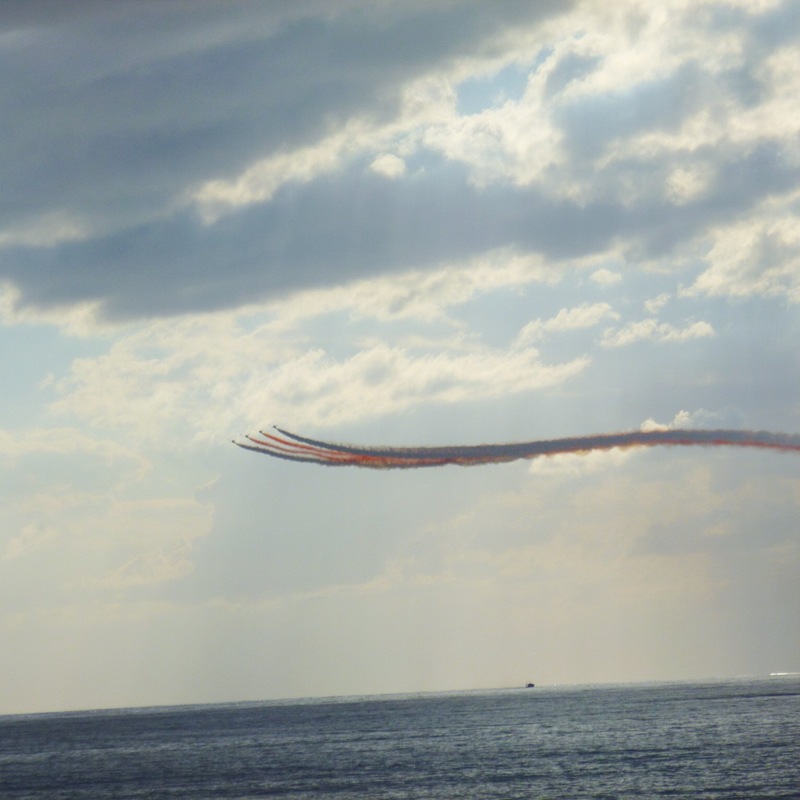 On Thursday they briefly flew over Ölüdeniz, Calis and Fethiye a few times to say ‘hello’, I wasn’t expecting it so when I heard the roaring engines of the low flying planes it was quite scary, it sounded like World War III was about to start! 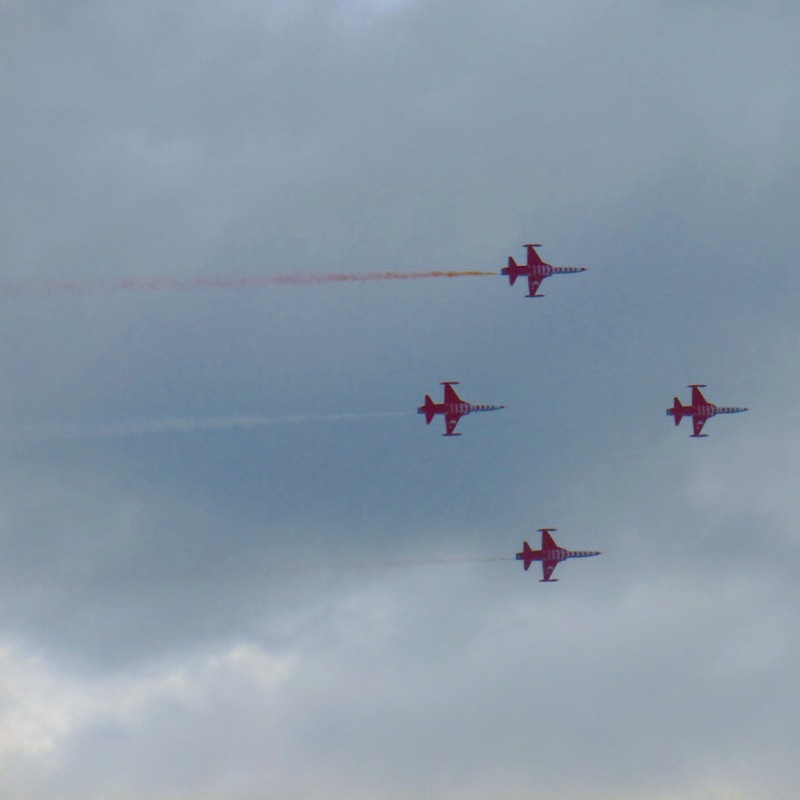 I went to stand on the balcony and got a few glimpses of the planes flying past and realised what they were. Berkay was in bed at the time and slept through it all, didn’t even move a muscle, typical man! 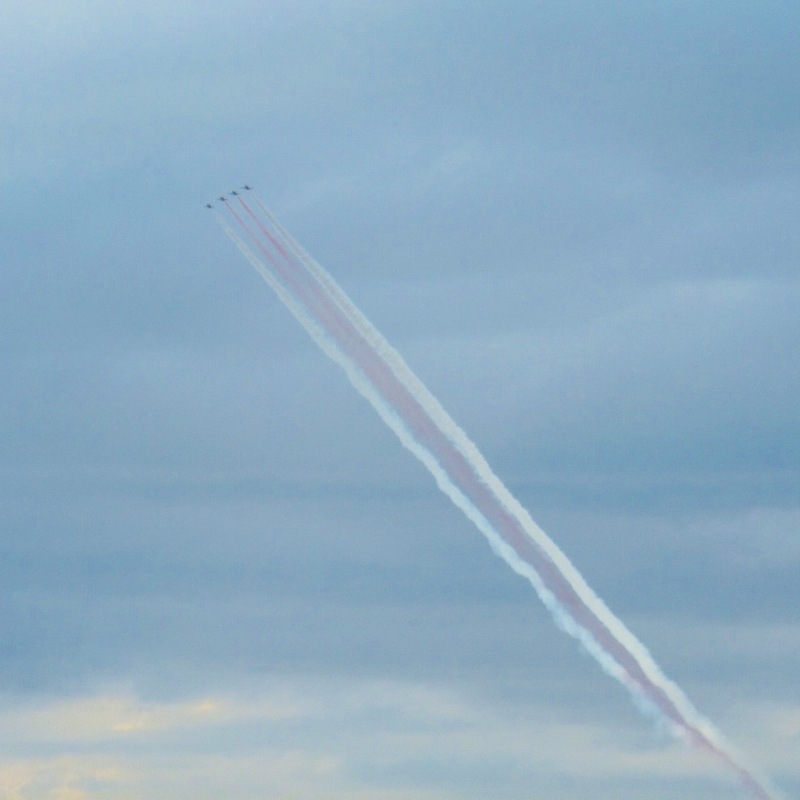 They were due to do a practice of the display on Friday but bad weather meant it was cancelled, which left us all wondering if everything would go ahead as planned on Saturday. We heard nothing more official announced, but the rain finally stopped at 3pm so we headed to the beach in hope that it might still go ahead. When we got to the promenade I was amazed by the amount of people that were already waiting, even though the weather was dodgy. We picked a spot on the wall along the beach and sat down patiently waiting. It got busier and busier and as we looked down the beach in both directions it was absolutely packed full of people, very unusual for the end of October! I honestly have not seen Calis Beach so busy all season, even in the height of summer, and it was really lovely to see it so full of people, even restaurants and cafe’s that had closed for the season had reopened especially for the occasion. 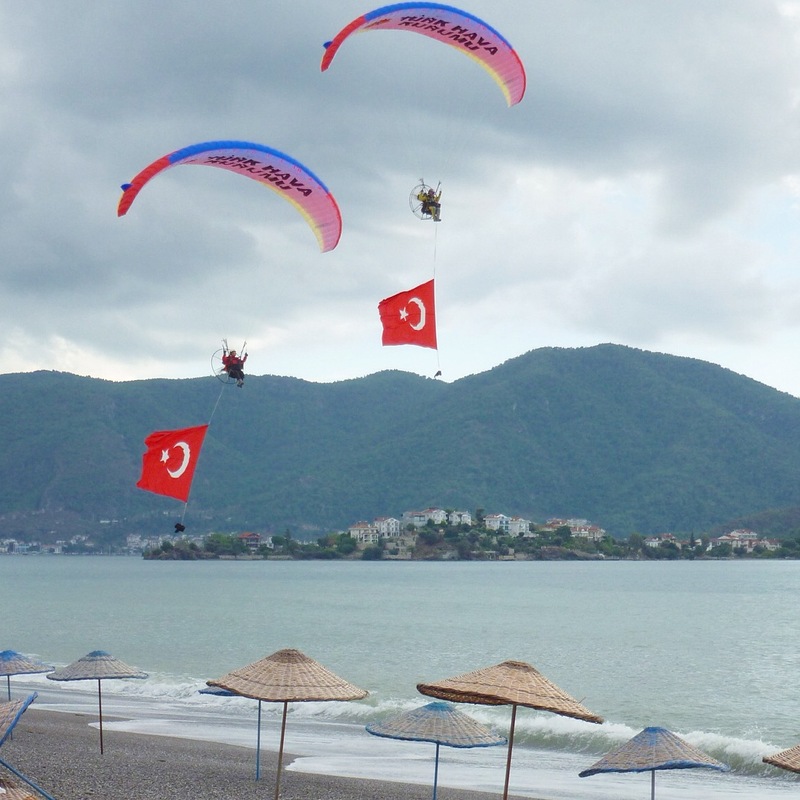 4pm came and the atmosphere was buzzing, a couple of powered-paragliders had flown up and down the beach draping huge Turkish flags below them which got the crowd excited for what was to come. 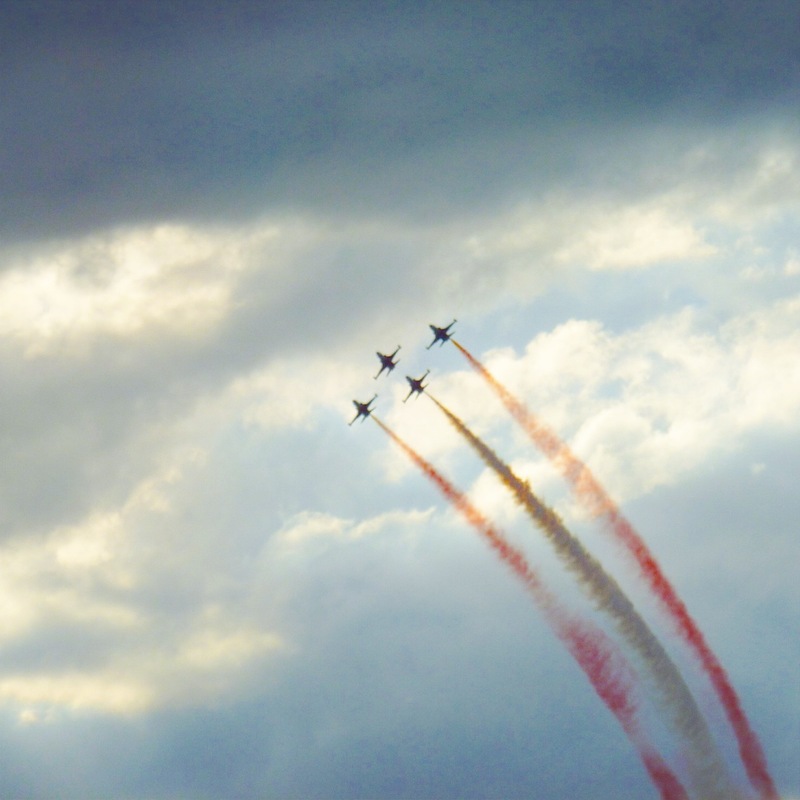 We waited, and waited, and at around 4.15pm people started excitedly pointing at the horzion, where trails of red and white smoke could be seen – it was them, the Türk Yıldızları were flying towards Calis at high speed. I quickly grabbed my camera and iPod – one in each hand, one for filming, one for photos. 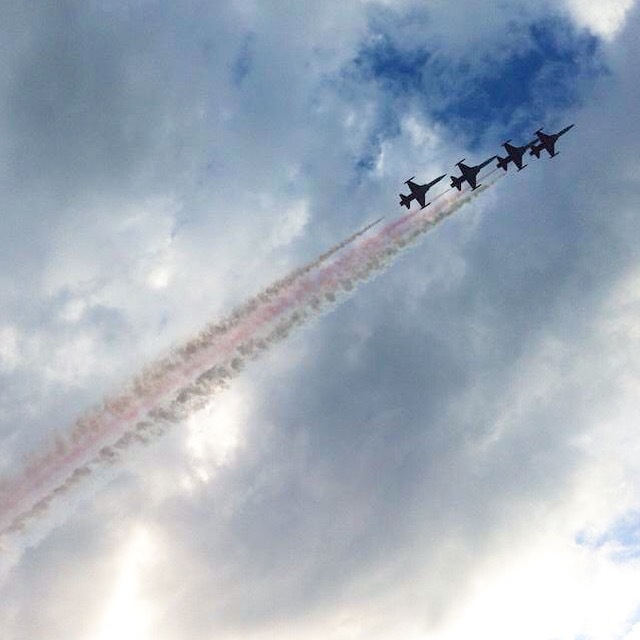 They got closer and closer and flew over our heads, there were 6 planes in total, and boy were they noisy. Berkay looked straight at me and said ‘Danni, how didn’t I wake up when they were here the other day?!’. 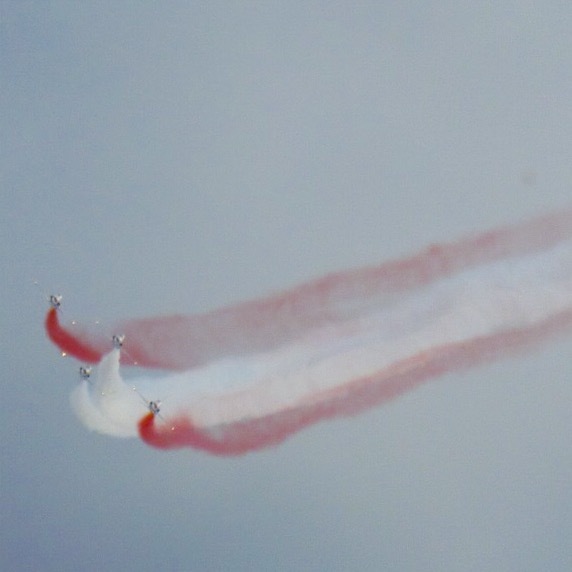 The display was absolutely brilliant, they perfomed amazing stunts, the pilots are among the best in the world and very talented. 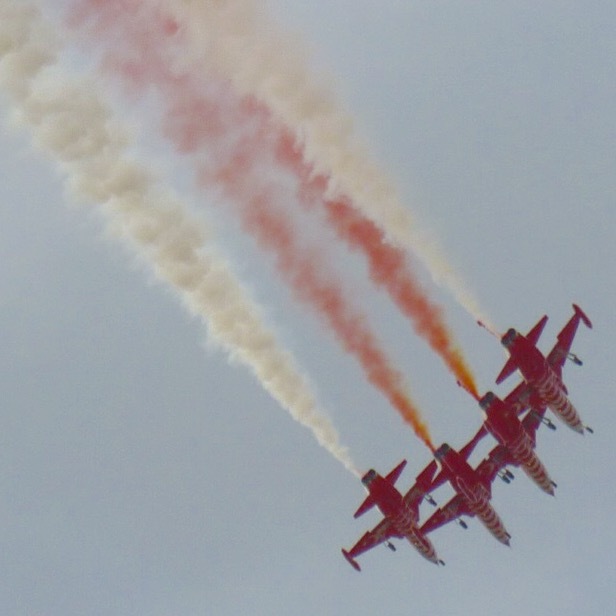 They flew perfectly synchnoised with each other, doing twists, turns and corkscrew spirals, even flying upside down – it was making me feel dizzy just watching! 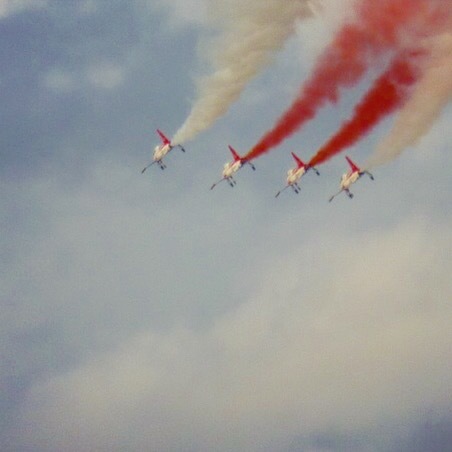 Aren’t the planes just beautiful with the Turkish flag underneath? It was difficult to take photos, videos and watch it in real time, so I ended up just pointing my camera up to the skies and clicking, not checking that anything was actually in the frame. I ended up getting some pretty good photos which capture the display well. The clouds added to the dramatic scenes and made it look even more impressive. I edited over 30 minutes worth of video clips into a 2 minute 40 second video which you can watch here: https://www.facebook.com/video.php?v=756223634439508 I’m quite proud of how well it turned out, considering it was only filmed with my iPod while multitasking! You definitely need to watch it with the sound turned up to get the full experience. 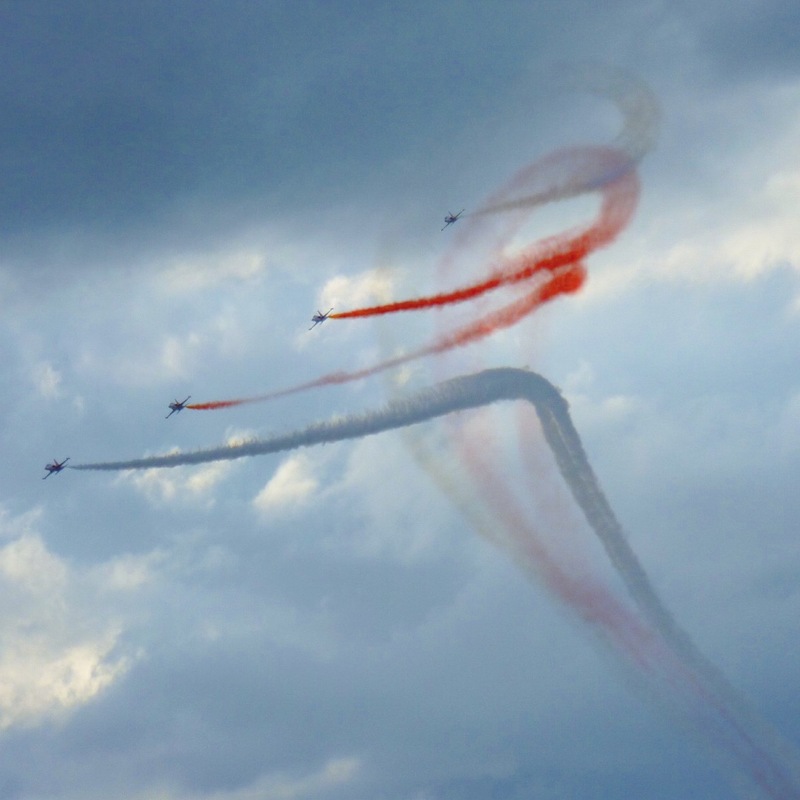 Around 40 minutes after they started, the display ended and off the Türk Yıldızları flew back to Dalaman. The crowd was buzzing. 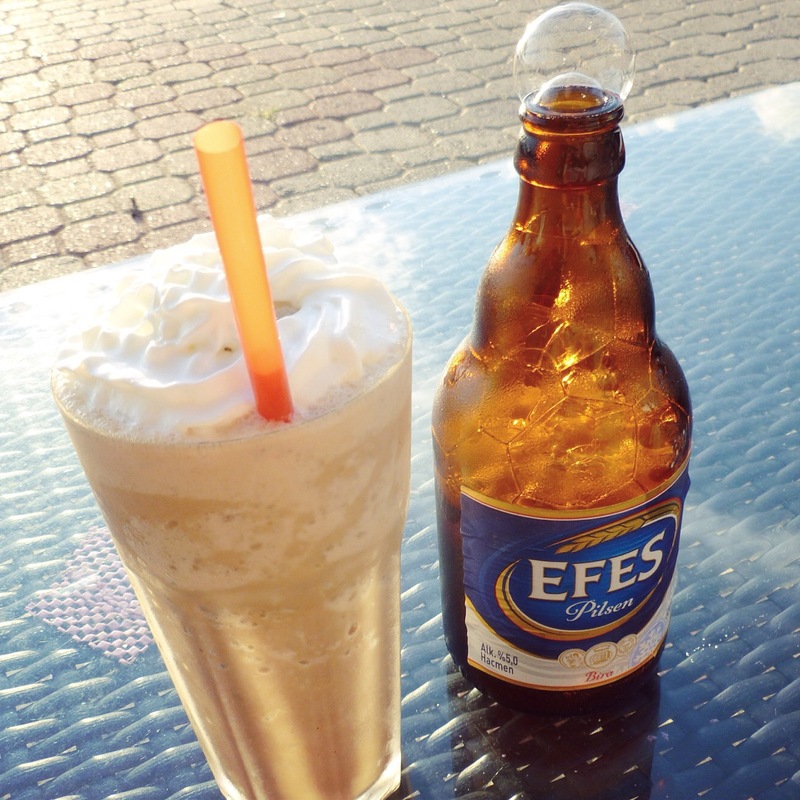 We went and sat down in a cafe to soak up the atmosphere for a little longer and relaxed with an Efes and an iced coffee – perfect. The clouds cleared and the sun came out. We saw a lot of people walking past with Türk Yıldızları merchandise and decided to head in the direction they were coming from to see if we could buy anything for ourselves. We found a tiny trailer where a few members of the Türk Yıldızları team were selling hats, shirts, pens, lighters, bags etc all at reasonable prices. It was very popular, a large crowd of people were surrounding them and their stock was selling out quickly. Berkay purchased a cap, which he got signed by one of the team, and I got a pen and a magnet, as I seem to have started a little collection of those on my fridge. We wanted to buy a tshirt but didn’t have enough cash, so Berkay asked them to save us a couple as he ran off to the ATM, 15 minutes later he came back but it was too late as the shirts had been sold and the little shop was closing up as the stock had all gone! It was disappointing but maybe a blessing in disguise as I think we were just buying things for the sake of it! As we were walking back home, we met a couple more of the Türk Yıldızları team, First Lieutenant Selim Şensoy and Senior Master Sergeant Ibrahim Çetinkaya, who were happy to pose for photos with us! 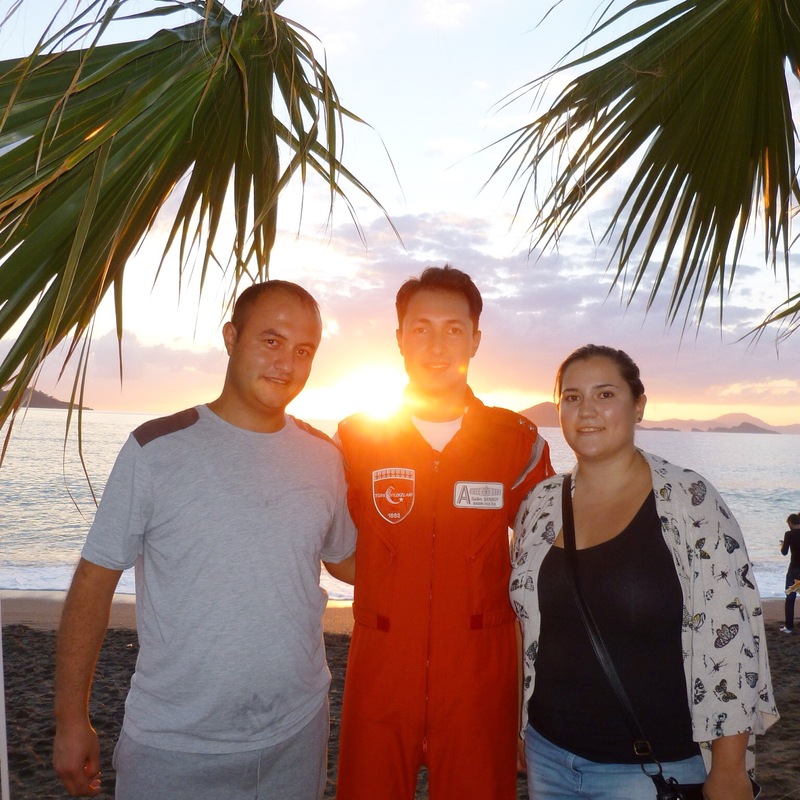 Overall it was a brilliant day, the atmosphere along Calis beach was really special and it was lovely to see families having a day out together and both local people and tourists sharing in the experience, a perfect end to the summer season here. 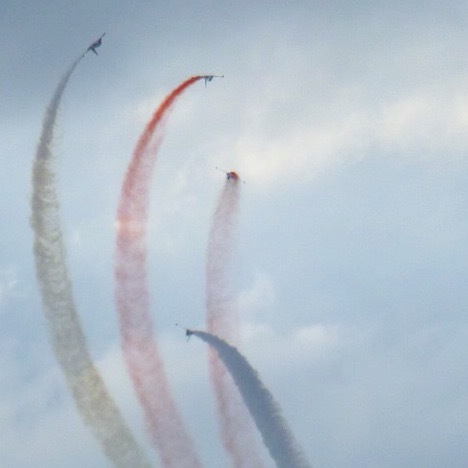 Bravo, Türk Yıldızları & thank you for coming to Fethiye! 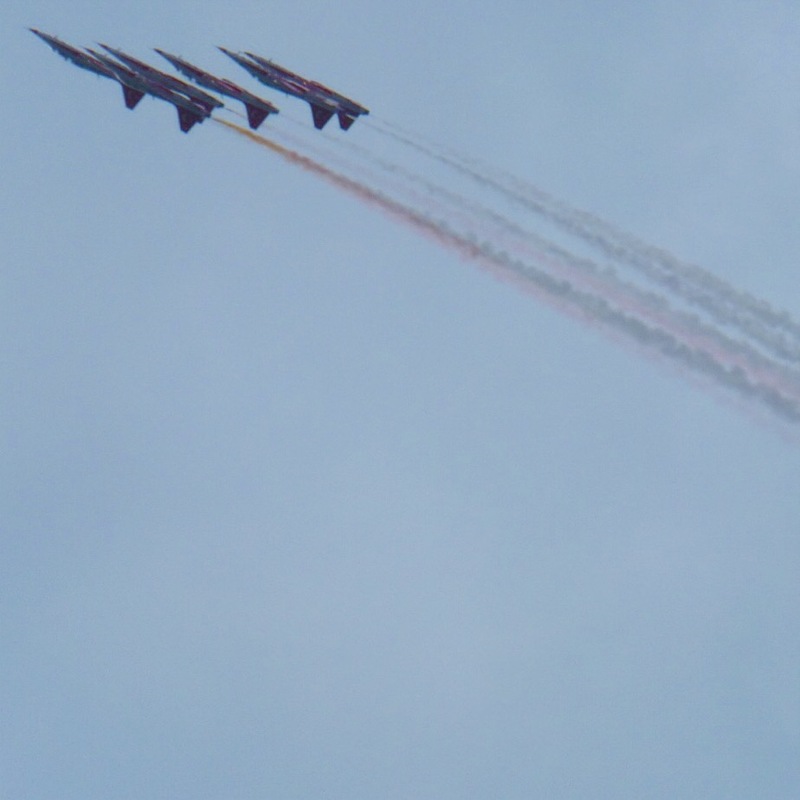 Great pics…..this summer I was in Izmir visiting my husband’s family and while we were in Alsancak area in Izmir having a Starbuck’s coffee I almost dropped my cup…..because those jets were practising for a show the next day and flew so close by that everyone thought at first it was an attack for a few seconds. 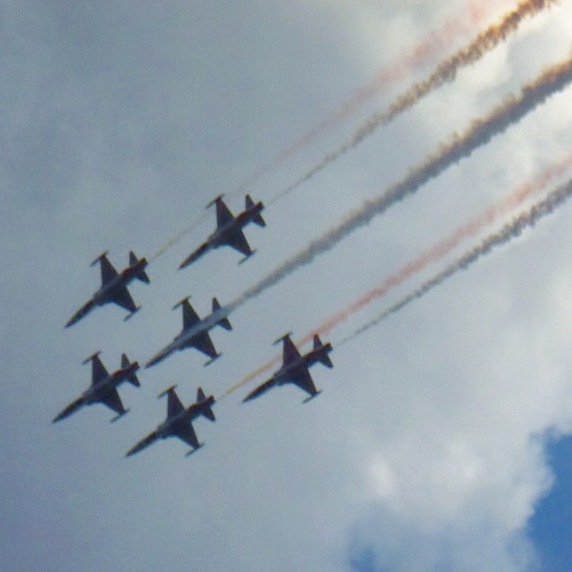 They are so synchronized together and I love that they are painted with the Turkish flag underneath….I don’t see those jets here in Canada and the US painted like that. After Turkey we went to London….and Brighton…..love England. My daughter is studying there and she love the UK. A bit different but she is enjoying it . That was my first thought too, i cant believe berkay slept through the first practice! Crazy lol. Typcial man!